Pruning apple trees brings fear and trepidation to gardeners. 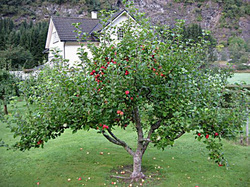 Pruning apple trees improves the tree's vigor and fruit production. But it just seems so complicated. Take heart. It is almost impossible to kill a tree by pruning it. And most of the intimidating pruning takes place the first 3 years of an apple tree's life. Conquer that and you're 90% done. Pruning apple trees should be done in the winter, encouraging the plant to grow more during the growing season. The first level of branches should begin between twenty-four to thirty-six inches above the surface of the soil. The branches growing out of the central leader should be either weighted down or tied loosely to string to promote outward growth as opposed to vertical growth. Recent U.C. variety evaluations in Irvine, CA. determined that the best flavored apples were Fuji, Anna, and Gala. Gala was superb. The most vigorous growers were Pink Lady, Gala, and Jonagold. Greatest fruit number and total weight per tree were Anna, Dorsett, Granny Smith, and Braeburn.. Videos below: Stephen Hayes in the UK produced a series of apple pruning videos which go over the basics of tree structure and pruning.